Those folks at Chipotle…if anything, they’re givers. In a near-repeat of this summer’s Costco-related giveaway, the San Bernardino Chipotle at 1092 E. Hospitality Lane, #B (at Tippecanoe Avenue) is giving away a free burrito, bowl, salad or order of tacos when you bring in a Best Buy receipt dated November 27, 28, or 29. Unfortunately, I just found out about the offer tonight and…even though it started yesterday, it’s only good until tomorrow (November 29). Chipotle is open from 11 a.m. to 10 p.m. I used my Best Buy receipt to get a veggie burrito, a slight change of pace from my usual veggie bowl. What did I buy at Best Buy? Hellboy II: The Golden Army on DVD, on sale for $3.99 in the store, but on their Web site for $2, which they matched. Yep, for $2 I got dinner and a movie. Apparently I am a cheap date. Christophe’s Restaurant and Lounge opened November 19 in downtown Upland, in the former D’Uplanders space. Chef Christophe Jardillier, previously of Rancho Cucamonga’s French/Italian restaurant Le Bellisimo, aims to bring “fine dining with emphasis on French cuisine” with this venture. The restaurant has a wine and spirits lounge, private dining room, outdoor caf and marketplace. It’s open for lunch and dinner, and reservations are now being accepted for dinner and holiday celebrations. It’s also the first restaurant to open with help from the city’s new loan program, which is intended to encourage restaurateurs to open new sit-down, full-service restaurants in certain parts of the city. The loan program (and Christophe’s opening) is detailed in an article by Sandra Emerson in today’s Daily Bulletin. Click here to read Sandra’s article. Christophe’s is located at 296 N. 2nd Ave. (at C Street). It is closed Mondays. For more information, call (909) 256-4327. 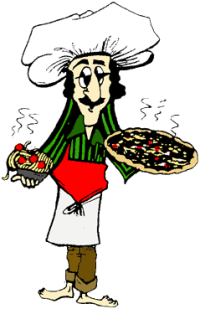 According to Joy Juedes’ article appearing in The Sun today, the Redlands location of the Old Spaghetti Factory (in the old Babe’s Slim PigN’s building at 1635 Industrial Park Ave.) will open December 7. That’s about a week earlier than previously announced. It’ll be the third Inland Empire location for OSF, after Riverside and Rancho Cucamonga. Click here to read Joy’s article. By now, you’ve probably gorged yourself on carbohydrate-laden goodies from your Thanksgiving feast and you decide to check Dine 909 just before the food coma sets in (you wonderful reader, you!). You’re in luck, because we have a few more tips for you holiday foodies. Be sure to store your leftovers within two hours of cooking. Sure, that post-meal nap sounds nice right about now, but postponing putting away your carefully-planned spread could mean food poisoning later on as bacteria colonize your neglected, cooling turkey and side dishes. of 165 F or until hot and steaming. Now you can rest with the knowledge of proper holiday food care. Happy Thanksgiving from Dine 909! All of us here at Dine 909 wish you a Happy Thanksgiving…whether you are cooking your meal, buying a pre-made one, going out for dinner, or just sponging off of are dining with someone else (Thanks, Mom & Dad!). We also care about the littlest Dine 909ers — no, not your children — your pets! That’s why we’re passing along these Thanksgiving pet safety tips from the San Bernardino County Animal Care and Control Program. San Bernardino’s Euro Deli, which replaced a short-lived Quiznos at 292 E. 40th St. (at Waterman Avenue), is apparently itself going to be short-lived. News assistant Kristina Hernandez reports that there is a going-out-of-business sign on their door. One would think that the business, which shares a building with a Starbucks, would be in a decent location, what with all the mountain commuter traffic during weekdays, at least. So, if you’re in the mood for a bratwurst, you better hurry! Well, imagine my surprise last week when I went to my local Stater Bros. to pick up ingredients for making butter pecan ice cream when I spotted a lone bottle of Broguiere’s egg nog sitting on the shelf in the dairy case. Perhaps someone high up in the Stater Bros. chain of command saw my plea from last year. Whatever the reason, it took about a half-second for me to grab it off the shelf and throw it into my cart. It’s not cheap — Stater’s sells it for $6.99 a quart — but it sure beats driving to Montebello to pick it up directly from Broguiere’s dairy, as I did last Christmas Eve. I had a second surprise when I sat the bottle on the conveyor belt at the checkstand and realized it was one of the Huell Howser bottles. old-fashioned nog, you really should give Broguiere’s a try. Tonight in Norco, Bob’s Big Boy got the boot. Actually, a pair of boots and a cowboy hat. What seemed like half the town of Norco showed up to celebrate the culmination of a two-year journey for the Western-clad statue. When the restaurant was in the planning stages in late 2007, the planning commission of “Horsetown USA” didn’t think the iconic mascot was Western enough. So they requested a makeover. 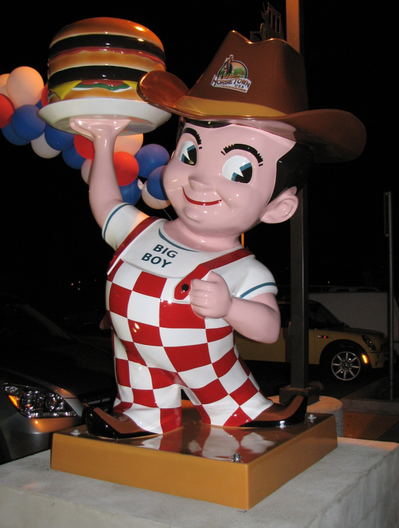 The restaurant’s headquarters, having complied once before by putting a Tyrolean hat on the Big Boy statue in Alpine-themed Gaylord, Mich., agreed to the change. The restaurant opened in March of this year, but without the customized Big Boy. The statue finally arrived late last month and the date for the big debut was chosen.